Effective human resources can give organization with structure and the ability to fulfill business needs through managing company's employees. Human resource management is a body of knowledge and set of practice that defines the nature of work and regulates job relationship. Human resource management is vital part of the organization that is associated with the “people” dimension (DeCenzo and Robbins, 1996). It is a staff, or support, junction in the organizations. Its role is to provide support in HRM issues to line employees, or those directly involved in producing the organization’s goods and services. Every organization is comprised of people; acquiring their services, developing their skills, motivating them to high levels of performance. Human Resource Management constantly contributes to organization by enhancing the productivity and development of personal occupation. Human capital: Assisting the organization in obtaining the right number and types of employees to fulfill its strategic and operational goals. Developing organizational climate: Helping to create a climate in which employees are encouraged to develop and utilize their skills to the fullest and to employ the skills and abilities of the workforce efficiently. Helping to maintain performance standards and increase productivity through effective job design; providing adequate orientation, training and development; providing performance-related feedback; and ensuring effective two-way communication. Helping to establish and maintain a harmonious employer/employee relationship. Helping to create and maintain a safe and healthy work environment. The major HRM activities include HR planning, job analysis, job design, employee hiring, employee and executive remuneration, employee motivation, employee maintenance, industrial relations and prospects of HRM. Human resource planning is reflected as a procedure by which the management ensures the correct number of people, at right place and appropriate time. It is a continuous process in organization. Planning is the central function of organizational management because it enables managers to decrease the uncertainty of the future and prepare them to perform better to cope with technical, societal, regulatory and environmental change which lead to success of the company. Dale S. Beach stated that “Human Resource Planning is a process of determining and assuring that the organization will have an adequate number of qualified persons, available at the proper times, performing jobs which meet the needs of the enterprise and which provide satisfaction for the individuals involved. Major objectives of Human resource planning ensure optimum use of human resources currently employed, avoid imbalances in the distribution and allocation of human resources, assess or forecast future skill requirements of the organization's overall objectives, provide control measure to ensure availability of necessary resources when required, control the aspect of human resources and formulate transfer and promotion policies. Human Resource planning cannot be rigid or static. It is agreeable to modifications, review and adjustments in accordance with the needs of the organization or the changing circumstances. Human resource division assists managers to distinguish the organization’s goals and thus guide them to do activities in organization. It assures that all workers recognize the general goals of the business. Learning more about company, employees can work more resourcefully to fulfil the organization’s general objectives. Studies indicate that explaining organizational objectives leads to better employee’s performance and contentment. The HRM planning process involves predicting HRM requirements and organizing plans to make sure that the right individuals are available at the right time and place. With this information, Business Company effectively plans its staffing, assortment, and training program. Human resource planning results in reduced labour costs as it helps the management to foresee shortage. Recruitment: Recruitment is considered as core function of human resource management through selecting appropriate employees and decides to employ suitable professionals or hire employees to fill employment needs, recruiting and providing training the best employees, make sure they can give better performance, tackle with performance issues and ensuring workforce and management practices follow the rules to diverse system. Recruitment is of the basic job of Human Resource Services. Previously, human resource management managers were dependent advice from existing employees. Currently, the challenge is to fill many important positions and equal employment chance which requires more complicated procedures to recognize and select potential workers. Basically, it has been documented that there is dissimilarity in enrolment and selection practices reflecting an organizations strategies and viewpoint to manage workforce. Applicants are recruited on the basis of their moral level and acquired skills. In many organizations, proficiency framework have been developed and utilized to identify the skills and qualities needed from potential employees. Such outline is important for allowed organizations to implement array of refined recruitment and selection procedures to categorize and select appropriate people. The success of recruiters and employment experts generally is measured by the number of positions they fill and the time it takes to fill those positions. Recruiters who work in-house as opposed to companies that provide recruiting and staffing services has significant role in developing the employer's labour force. They publicize job postings, source candidates, screen applicants, conduct preliminary interviews and organize hiring efforts with managers responsible for making the final selection of candidates. Learning: The main action of human resource management is to assist learning of employees. Organizations, who give more experience for continuous learning to their employees, can generate huge revenue and become successful in marketplace. Numerous studies demonstrate that there is significance of informal learning in developing human capital. Managers must actively involve themselves to promote the learning of staff. Some management studies have documented that the managers can contribute more in learning process in small organizations. Human capital theory states that manager’s involvement in workplace learning can develop good workforce (Boud and Garrick 1999). Learning is important to improve skills of employees and making workplaces into effective learning environments. There is copious literature on learning which proves that organizations strive to become learning oriented (Marquardt 1996). Many critics argue that learning is major factor for developing capable employees for the survival of organizations (Senge 1990). They stated that learning can facilitate organizations to cope up with fast changes in external environment. It is necessary to monitor the external environments, foresee, and acclimatize to continual change to flourish in business field. Organizations have to execute new technology, products or processes to compete with global companies. Some expert emphasized organizations that learn faster are in good position to face the challenges of technological revolution and avoid financial burden (Schein 1993). Training and Development: Training provided by Employers with the tools necessary to new employees helps them to transition into a new organizational culture. Many human resource departments also offer leadership training and professional development. Leadership training may be required of newly hired and promoted supervisors and managers to handle employee relations matters at the department level. Professional development opportunities are for employees looking for promotional opportunities or employees who want to accomplish personal goals. Training programs are performed by human resource management of organizations to develop skills and efficiency to improve performance at workplace. The main reason of training program is to widen the expertise of personnel and develop employee commitment. The requirement for training and development is assessed by the employee’s performance deficiency. HR experts make efforts to discover new ways to improve the effectiveness of company employees in their jobs and furnish them to adapt in challenging business environment. Training develop technical and managerial skills of workers, who are involved in core work in organization and have ability and passion to develop tacit knowledge to accomplish their career goals (Johnson et al., 1996). Tacit knowledge assists in developing organizational structures, productive and innovation capabilities of an organization. Training can be conducted in two ways such as on-the-job and off-the job. Usually, organization provides training during the job to personnel because it helps the learning of daily operations and refines basic concepts. Of the job training is given to special personnel who contribute to boost the intellectual capital and skills by gaining latest knowledge such as research techniques, operation of hi-tech equipment. According management theorists, training must be conducted in peaceful environment where sufficient returns can be anticipated (Grey, 2004). It must be accompanied by appropriate incentives and working conditions so that personnel’s knowledge can be fully utilized. The key objective of training is to develop talent in the employees. Training is critical for the success and production of business firms. Many organizations invest huge funds on training and development which leads to unbeaten performance of employees, institutions and nations. Development: Human recourse management task is very effective to build career of a worker. Activities of HRM are contributing in developing career enhancement program. In organizations, many career programs are organized to boost productivity of firm and employee performance, and to retain the talented professionals in organization. Through HRM, organizations can understand interests of their employees. After gaining mastery over HRM resources, individuals recognize more responsibility for managing their own careers. They improve efficiency and overall effectiveness for future career. Individuals develop their efficiency and realize their capacity to know market value. Candidates may be able to imagine careers as wide spectrum including numerous employers and various job prospects. With effective training program conducted by Human recourse management, employees can identify career goals that reflect their business policy. 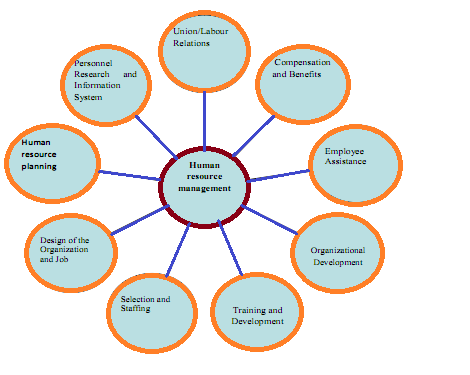 Human Resource Management helps the individual to plan thoroughly for lucrative career development. Human recourse management assists to manage employee’s competence that means recognizing their existing capabilities as well as the competencies the organization requires. 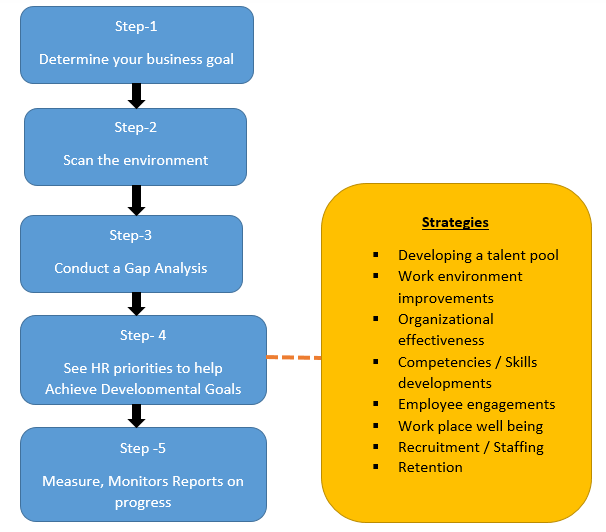 Human Resource Management help employee to develop goals that are associated with organizational stratagem. Human Resource can facilitate person to administer training courses by detailing target groups, course identification, locality, instructor and participants, and the issue of course certificates. The system provides general idea of the courses an employee has completed and employee can review his or her skills and competence areas. Job analysis: Job analysis is major component of human resource management. Job analysis is the foundation of the other employee’s functions. It results in two necessary documents such as the job descriptions and the job specifications. Organizational climate is shifting quickly due to the process of globalization and it is affecting on work and jobs in organization. The job design efforts to create jobs that appropriately align with the organizational work. Job analysis is done on the basis of activities of people during job. These data are useful to create job explanations and job qualifications. The main task of human resource management in job analysis is to collect data in an organized way and measure detailed information and human requirement of jobs. Job analysis is important because it certify human resource activities are significant because the legal defensibility of an employer’s recruiting and selection procedures, performance appraisal systems, employee corrective action and pay practices on the groundwork of job analysis. In job analysis, the information is compiled into job descriptions and job specifications for use in almost all human resource activities. Exact details of job requirements are needed to validate HR actions associated with for EEO issues. All activities of HRM such as HR planning, employment and selection must be based on job requirement and the competence of candidates. Job analysis has immense importance in recognizing job factors and duties that maybe useful for workplace health and security issue. 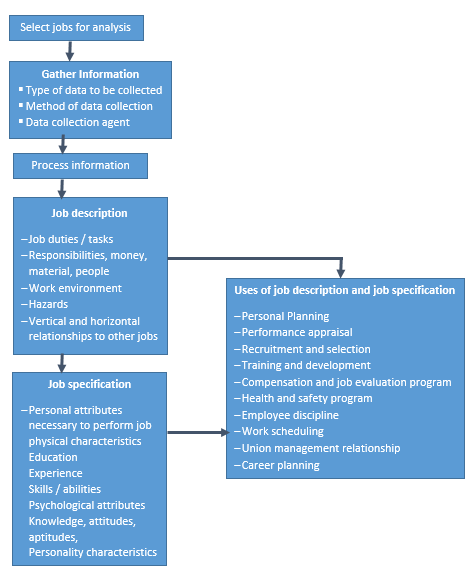 Numerous ways and data sources are used to perform job analysis. Observation, interview, questionnaire are the common methods of collecting job analysis information. A complete assessment of job can be demanding or troublesome experience for both managers and employees because job analysis can recognize the dissimilarity between current and future job. 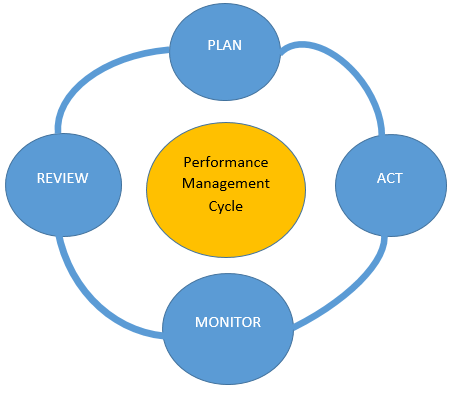 Performance management: Performance management is an effective procedure the managers use to measure job performance, maintain productive work groups and identify workforce for meeting the company's performance standards. Management theorists stated that Performance management is a process by which managers and workers work together to plan, monitor and review an employee’s work objectives and overall contribution to the organization. Performance management is the continuous process of establishing objectives, appraising progress and providing on-going coaching and feedback to make sure that employees are making efforts to accomplish their objectives and career goals. Performance Reviews: A business will have to set out a mission statement to recognize its aims and objectives and also create value statement on how these aims will be accomplished. The triumph of organization as well as the performance of employees can be monitored and assessed for improvement using the set objectives of the company. A feedback known as performance appraisal is then given to appraise the performance of the company and give scope for performance adjustments. Self-Evaluation: Workers are encouraged to make goals and assess their own performance to fulfil their goals. This allows employees to take responsibility and observe their own performance. It helps employees to develop inter personal relations and let them know what exactly their job is all about. Peer Evaluation: This method verifies the result of a team work and helps the team to work together effectively. This helps employees to value each other’s contributions on matters affecting the success of the company. Target Setting for Individual / Groups: This is a process where targets are set in alignment with the department goals, which are set to meet the company’s goals. Measuring Individual / Group Output: Most companies utilize how capable an employee or group is to measure their performance. A worker could either be rewarded in form of bonuses or increments in salaries based on his performance. The purpose of performance management process is development of employees' work-related skills, knowledge and experience. The development process gives the managers and their employees the opportunity to work jointly to improve each employee’s performance and to contribute to organisational goals and objectives. A human resource manager works collaboratively with the organization's leadership to decide the type of coaching philosophy the company should adopt. Many employers have step-intensive performance management systems that include regular performance appraisals and progressive discipline policies. Other companies use less formal methods and unusual methods for measuring performance and providing positive feedback to workers. Successful performance management system is job specific and include array of jobs in the organization, provide an accurate image of each employee’s performance, include a combined process for setting goals and measuring performance based on two-way communication between the employee and manager, monitor and measure results and behaviours, provide training and development opportunities to enhance performance, make sure that employee work plans support the strategic direction of the organization, establish clear communication between managers and employees about what they are expected to accomplish, provide positive and continuous feedback on performance, categorize and recognize employee accomplishments, recognize areas of poor performance and establish plans to improve performance, Support employees to complete their work and accomplish career goals by recognizing training needs and development opportunities, Support administrative decision-making about promotions, terminations, compensation and rewards, provide legal documentation to reveal due diligence for legal challenges related to sacking or vicarious accountability. Compensation and benefit: The compensation and benefits is related with managing the personnel expenses budget, setting the performance standards, setting the transparent compensation policies and introducing the competitive benefits for employees. The organization with good compensation and benefits drives its personnel costs, manages the performance of employees and rewards the extraordinary performance. This is the area of wages and salaries administration where wages and compensations are unchanging scientifically to fulfil the criteria of justice and impartiality. Additionally, labour welfare measures are involved which include benefits and services. The compensation and benefits offers the managers with the compensation tools to build a difference among employees as the high performance corporate culture can be developed in the organization. The compensation and benefits department observes the external job market and optimises the personnel expenses budget of the organization. A well-organized compensation and benefits plan helps to attract, motivate and maintain talent in company. It will benefit in the following ways. Job satisfaction: Employees would be happy with their jobs and would make efforts to work for organization if they get fair rewards in exchange of their services. Motivation: A compensation plan that hits worker´s needs is more likely to motivate them to act in the desired way. Low Absenteeism: Employees will not take leaver if they get benefit for their work. Talent management: Talent management can furnish organizations to develop long-term policies so that good workers can be recruited for the business success. 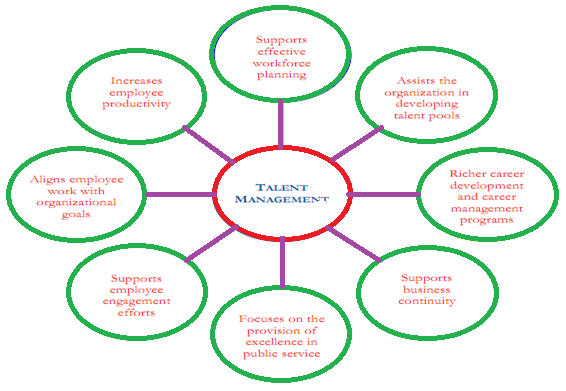 Talent management is an emergent practice to adopt new technology for the betterment of organization. Managing talent is about ensuring that the organization has an external talent pool available from which to draw capable candidates, while at the same time continuing to build on the existing talent that exists within the organization. The goal of human resource management is to categorize, manage and retain talent across the organization to set new strategies of success. It is needed that organizations integrate practical talent management solution in the business. Talent management has become a standard for organizations to make competitive business environment through their human capital possessions. This can be accomplished by enhancing current personnel performance and developing them for future (Davis, 2007). Organizations that successfully manage their talent provide benefits to the employee and to the clients whom the organization serves. Employee and labour relation: Employee and Labour Relations specialists help with individual questions, conflicts, and issues that arise in the workplace. In human resource management, Labor relation is considered as “the relationship between labor or employee and the employer”. The relationship between managers and their workers must be managed legally and effectively. Employer and employee rights must be addressed. It is important to develop, communicate, and revise human resource strategies and procedures so that managers and employees both understand what is expected. In some organizations, union/management relations must be addressed as well. The term labour relation refers to the communication with employees who are represented by a trade union. Unions are organization of employees who join together to obtain more voice in decisions affecting wages, benefits, working conditions and other aspects of employment. With regard to labour relations the major function of human resource includes negotiating with the unions regarding wages, service conditions and resolving clashes and complaints. To summarize, human resource management plays vital role to enhance organizations position and assess capabilities of employee through various activities. Useful recruitment and selection practices of HRM can recruit well trained applicants. Human Resource Management is also a planned and wide-ranging function to manage people and the organization culture and environment. Effective human resource management allows employees to contribute successfully to the overall company direction and the achievement of the organization’s objectives. Human Resource Management is changing from conventional workers, administration, and transactional roles, which are increasingly outsourced.